Last Monday was the first Martin Luther King Jr. Day where my daughter was old enough to actually ask us about Dr. King and the resulting discussion was awkward, to say the least. The awkwardness began with my daughter’s recounting of what she’d learned about Dr. King in kindergarten, which, of course, was completely jumbled and reprioritized once it passed through her still-developing brain. First, we heard that Dr. King had bombs thrown at his house, then we heard that he got shot (“With a gun, Dad. With a GUN. And he DIED.”), and then we heard, “He just wanted people to love each other.” And those were my daughter’s main talking points about Martin Luther King Jr. – bombs, a gun, and loving each other. It was weird and earnest and cute all at the same time. We went to a bookstore on MLK Day and my daughter got very excited to see a picture book on Dr. King that her teacher had read in class – Martin’s Big Words: The Life of Dr. Martin Luther King, Jr. by Doreen Rappaport and Bryan Collier. She was so enthusiastic about the book that we bought it for her and spent her bedtime reading and discussing it. Martin’s Big Words is an excellent introduction to the life of Dr. King and the concept of “civil rights” as a whole. My daughter was extremely confused about why white people could make a black person give up their seat on a bus, so we had to try to explain racial inequality to her on the fly and I think it went OK. It’s always hard to tell what she absorbed and what she didn’t, but it was a good discussion to have and Martin’s Big Words was a great facilitator of that discussion. 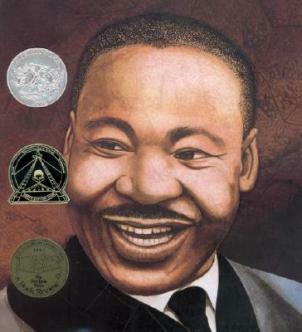 And Martin’s Big Words doesn’t shy away from things like Dr. King’s assassination, but, to its credit, it does present those details in a very authoritative, non-threatening way for younger readers. 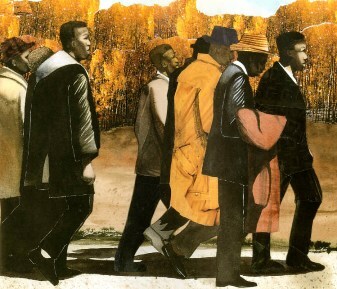 I was impressed at how, as a book, it balanced the concerns of its young reading audience with its mission of educating those same kids about the reality of the American civil rights movement. Our kid’s nonfiction collection at home is primarily made up of science books at the moment, so I’m actually really pleased to have such a great work of social history in our home library now. As I’ve mentioned on this site before, the second that I found out that I was having a daughter, the g-word – GENDER – became a BIG priority for me. I started spending an obnoxious amount of time examining how gender was addressed in every book that came our way, from The Berenstain Bears to Madeline. However, when I look at a book like Martin’s Big Words, I get concerned that – while spending so much energy worrying about gender, steadfastly letting my daughter know that she didn’t need a prince to save her and plying her with books that backed that argument up – our home library may have relatively ignored two other major social concerns that perhaps deserved the same attention. Those two issues in question? Race and class. 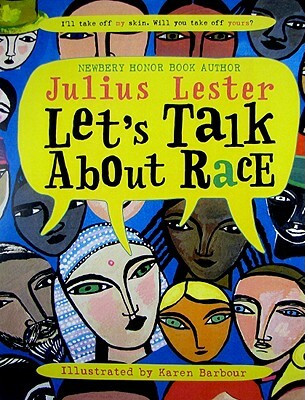 Bryan Collier does an amazing job illustrating "Martin's Big Words"
Don’t get me wrong – race and class are NOT easy things to discuss in ANY situation, particularly when you’re trying to discuss them with kid under the age of five. Talking about race and class is normally (in my experience) complex, messy, divisive, and awkward, awkward, awkward. And I’m a lower-middle-class, liberal white guy, so, of course, my tactic has always been to teach my daughter to avoid any discussion about race because “she shouldn’t learn to define people through the color of their skin.” Which is a lovely lower-middle-class, liberal white guy sentiment on the surface, but, as my daughter gets older, I’m starting to realize that my “enlightened views” might, in reality, just be a cowardly way to avoid discussing race with my kid. I've heard good things about this book, but I'm pretty sure the tagline on the cover - "I'll take off my skin. Will you take off yours?" - would just freak my kid out. BUT I do think that – while building up my daughter’s home library – we have spent much, much more time finding books that intelligently deal with issues of gender than we’ve spent finding books that deal similarly with race and class. I will say, in a quick defense of her current book collection, when you have a kid who’s five and under, a very, very large portion of her books feature mostly non-human characters, so, while we actually have sought out books in the past with ethnically-diverse characters, it becomes a murkier – and easier-to-ignore – issue when every character in the book is a duck. Also, while many modern picture books really do a fairly great job at presenting ethnically-diverse casts and images of non-traditional families, a lot of those books “present” that diversity without really ever addressing it. There’s a part of me that wants to say, “And that’s my goal for 2012 – filling her library with books that really address racial and socio-economic divisions,” but I also realize that it’s a hard goal to work towards. First of all, it sounds BORING. Fine, call me insensitive, but when you just say it like that “I want to teach my kid about race and class”… it sounds like starting a college term paper. What I think I actually want is to find really, really well-written books that excel at describing the human condition and find ways through story and character to address race and class. The danger – and this danger existed for our beloved books about gender – is finding books that know how to deal with those issues ELEGANTLY. The last thing I want is to start buying clumsy, didactic “socially-responsible” texts that try to bludgeon their readers with an allegorical sledgehammer and never look back. I really don’t want to have to sit in bed with my daughter and read her books like Martin: The Little Plaid Boy Who Was Just as Good as Everyone Else (Maybe Better) or Grabthar: The Poorest Elf in the Shire. Yes, my kid is in kindergarten, so I’m not going to be handing her The Cornel West Reader and telling her to work it out for herself. (Though, Cornel West, if you write a kid’s book, I’m not going to lie – we will totally buy it.) So, yes, there needs to be some level of age-appropriate allegory and imagery to help make the issues mentally digestible for a five-year-old, but, as with any other book I’ve ever bought for her, any book about race and class has to pass our home library’s number one criteria – everything else aside, is it a good book? 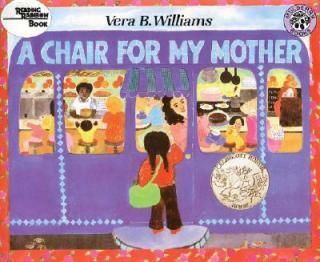 One of the best children’s books I’ve ever read that definitely addresses race and class is A Chair for My Mother by Vera B. Williams. It’s a beautiful picture book, told through a vibrant series of watercolor paintings, which recounts a legitimately heartwarming story and deals with some fairly complex social issues all at the same time. 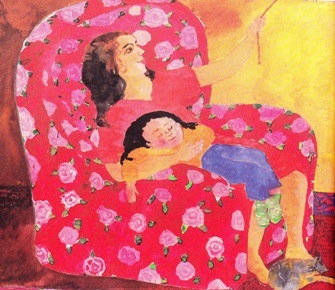 The story, narrated by a young girl, revolves around a mother and daughter using a big glass jar to save their change in order to buy a chair, a “wonderful, beautiful, fat, soft armchair,” for the mother to sit in when she gets home from work after working her long shifts at a local diner. A few pages into the book, we learn that they need the new chair because all of their possessions were burned in a house fire a year earlier. No one was hurt, but the family lost everything. However, through the generosity of their family and their community, they move into a new apartment and their neighbors help furnish their new home by bringing over extra furniture, pots and pans, curtains, toys, whatever they can spare. The only thing their new home is missing is a big comfy chair and, after a long period of saving, they finally fill up their big glass jar and go shopping for their new chair. The aftermath of the house fire in "A Chair for My Mother"
Now, with the house fire and everything, this might sound like a depressing premise for a kid’s book, but trust me – it’s not. The whole book is filled with more hope, optimism, and familial love than you can shake a stick at. Granted, I was a little worried that my daughter would freak out about the fire aspect and, full disclosure, the book did inspire a fairly productive conversation about house fires and how we protect against them. (She’s now hyper-aware of our smoke detectors.) But there are some wonderful messages throughout the book and the story is achingly warm and positive, even when discussing the fire. So, why is A Chair for My Mother a great book about race and class? In my opinion, it’s not because it hits you over the head with images of race and class disparity, but rather it presents a world where race and class simply EXISTS, which is fairly rare in a kid’s book. The family in the book doesn’t appear to be Caucasian, but their racial background isn’t made to be an issue either. We never learn about the girl’s father and Williams’ paintings show off a wide multi-ethnic cast of supporting characters. It’s a stunningly diverse world, filled with various skin tones and variations on “traditional” families, but Williams underplays the book’s diversity, never calling overt attention to it and making it seem like it’s the most ordinary thing in the world. And, in terms of class, not many children’s books ever address money as a big issue. Sure, there are books where kids are trying to save up for a new bike, but A Chair for My Mother is a book where the lead character wants to buy something fairly essential, but simply can’t. The mother’s long working hours and the grandmother’s thrifty ways give the impression of an extremely working-class family that is working hard to keep a roof over their heads. What really impresses me about Williams is that, while money concerns can be a HUGE source of anxiety for parents and kids alike, in A Chair for My Mother, she presents the reality of a family that needs to scrimp and save to get by, BUT she also creates a narrative world that feels safe enough that we’re never anxious or worried about the family. The girl’s family might have to work hard for what they have, but they’re also surrounded by a huge, supportive community and we’re never once concerned that the worst might happen. I think that’s an insanely impressive achievement. I don’t want to give the wrong impressions and make it sound like A Chair for My Mother is entirely about race and class. It isn’t. It’s mostly just a lovely story about family and community. BUT, as I mentioned before, what I like about A Chair for My Mother, is that it creates a world where race and class EXIST and where race and class can be used to make the background texture of the story all the more real and human. It uses race and class in a very subtle way, as opposed to using it as a storytelling sledgehammer of social finger-wagging, and I just don’t see that in a lot of children’s literature. This whole post has been a very long-winded way of saying – being the parent of a young girl, I think I’m really aware of how gender is portrayed in kid’s books. In the future, I would like to be as aware of how race and class is portrayed in those same books. I’m not saying that it’s going to be easy. And I’m definitely not going to start plying my daughter with weepy overdone social allegories that scream about equality without ever presenting a story or engaging characters. BUT I am going to keep an eye out for books – fiction and nonfiction works – that find ways to present race and class in an elegant, human, and relatable context and I’ll reward those books with featured placement on our home bookshelves and in our bedtime reading lists. So, if you know of any books that fall into those categories, please pass those suggestions on. When my brother and I were kids my Mom began putting collections of her favorite, often fantastically lefty, children’s books together for us as gifts to her future grandchildren. I think that she finally believes that she’s not getting any of the above-mentioned babies from me (perhaps she went overboard with the feminist indoctrination – clearly her own fault), as she had several of those classics out in the “garage sale” pile not long ago, including this one: http://www.amazon.com/Stories-Free-Children-Mcgraw-Hill-Paperbacks/dp/0070503982. Let me know if you want me to see if she’s still got my stash of books around, as I’d love for you guys to have them. Kenzie got my brother’s stash, as far as I know. I’m behind in reading your blog. . . . When I saw the title here, the first book I thought of was “A Chair For My Mother.” Then I read your post. Darn, you’re good. 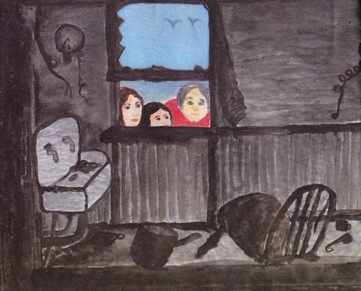 Another – Robert Munsch’s “Smelly Socks.” It’s about a girl — who I assume is native american living on a reservation in Canada– that wants a new pair of socks, but the store in her town only sells black socks. So, she embarks on a grand adventure with her grandfather to get a new pair of socks. Another is called “The Mom Book,” which is about all kinds of Moms. Barak Obama’s book “Of Thee I Sing” is one that actually tackles these subjects, but reads in a way that is interesting to little ones who don’t understand the deeper meaning. I love that book. And, we’ve got a few books in spanish, stories set in different countries, and board books with people of color that tackle the usual themes. In the Dinosaur genre, there are many books with the theme of diversity and inclusion and appreciating differences. We have one called “Dinosaurrumpus” and another Dinosaur Crunch. Dinosaur Train, the PBS show, is another great example — wherein the Ptranadon family adopts a T-Rex. Now, with my little ones, my white upper-middle class strategy is to not point out race/class differences. I really don’t think my 3.5 year old sees skin color as a salient difference. Recently, we were invited to a birthday party by a boy that I did not know. During the week before the party, I asked F to tell me about the boy. I learned all about him — who picks him up, who drops him off, at what times these events occur, that he did not have siblings, what his favorite toys are, his favorite superhero, that he was fast, that he had brown hair, that he did not get hot lunch like F etc. . . Well, we showed up to the party where I learned that he was African American — never had F told me the color of his skin. Sooner rather than later, this will crumble, I know. And for that time, I’d like to have some books to help us along. I think that you got it exactly right — this topic is AWKWARD. I’d like to think that its awkwardicity (look, I’m creative!) is the reason that so few people shared, liked, commented on your post — especially relative to princesses — not because they are not thinking about it or don’t care. Indeed, if you and I were not personal friends, I might not feel so comfortable commenting here for fear that I would say the wrong thing (yes, I know I posted in a public forum). This awkwardness is also likely the same reason that it’s hard to find books that adddress this issue, creating a circular problem. Thanks for not being afraid! If anyone ever criticized you for alledgedly saying the “wrong thing” on MY blog, Megan, I would beat them into unconciousness with their own shoes. So no worries there. Thanks for your comments – and wonderful reading suggestions! You’re taking this post EXACTLY how I intended. I don’t think anyone needs to preach to their kids about racial differences and class inequality before their kids are ready. It’s amazing to see kids interact at such young ages with no concept of racism or prejudice. I’m not an advocate for abruptly ending that idyllic period, BUT, at some point, thanks to exposure to the outside world, kids are going to start asking and probing their parents for information on race and class. “Why is this boy ____?” or “Why is that girl _____?” And I just think parents need to not chicken out and be prepared to answer and address those questions. And the books that are getting mentioned in this comments section are GREAT resources to help facilitate that discussion. So… yay readers and commenters! You guys rock. This is the post I will return to next time I place a book order with Aunt Marye Beth in Milwaulkee! Right now, we’re still working through Christmas. BTW, we LOVE Pete’s A Pizza. It is in the very small category of books that both G (1.5) and F (3.5) enjoy reading together. It’s simple and short enough to please G, but funny and complex enough to cause F to wear a huge smile the entire time he is listening. Also in this category: “Those Darn Squirrels”. . .though even with that book, I have to skip some pages if G is part of the audience. I’ve read so many posts in the last week or so due to MLK Day. I know that there are more but there is one post that I can point you to that specifically mentions some books: http://www.rageagainsttheminivan.com/2012/01/how-to-talk-to-kids-about-race-and.html It’s from a woman in SoCal who has a black son adopted out of foster care, one adopted from Haiti, and two other biological children. Her oldest (6/7 years old)learned about the Civil Rights movement in school recently which she is referring to at the beginning of the post.